The text on the cover of the L.L. 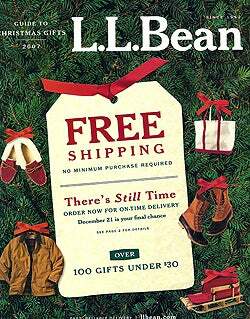 Bean catalog reads, "There's still time" — because if you place an order today, December 21, you can get your gifts in time for Christmas. What kind of stuff do they have? Cool "Slope Sliders" for fun in the snow; plaid duct tape; maple syrup in a bottle shaped like a bear; cozy/chunky Irish fisherman sweaters. All this and more, after the jump. It's the last minute, and you're scrambling for stocking stuffers. How about the plaid duct tape ($9.50 for a pack of two rolls, one of each color) or the Toblerone in a bottle ($19.95)? Everyone likes chocolate-peppermint cookies ($19.50) and the Flex Reading Light may be random, but fun for kids ($16.95). More good (affordable) stuff! The Slope Sliders are the best kind of sled - just sit and go ($19.95 for a set of four); the Polar Bear Maple Syrup ($19.50) is a good host/hostess gift; and even though we have no idea how to play Cribbage, the Folding Cribbage set ($19.50) is awesome. Yum, breakfast. Perfect anytime of the day. Breakfast sets include pancake mix, syrup, preserves and keepsake tote bags. There's also a hot cocoa set! Prices range from $29.50-$39.50, or just get a half-gallon of syrup for $45. Uh, so hungry right now. Victoria's Secret's "Last Minute Gifts": Whose Fantasy Is This, Anyway? J. Crew's "Very Merry Gift Guide"